"The habitat to one of America's greatest legends may be at risk." - Thaddeus Guttenberg, U.S. Forest Service, Mythical Wildlife Division. Photo Credit: Mary Horning, U.S. Forest Service. There are many reasons the U.S. Forest Service conserves open space. It allows us to deliver clean water, provide space for recreation activities and maintain wildlife habitat for a variety of creatures – most notably the North American Sasquatch. While most people believe the Sasquatch to be a thing of folklore and urban legend, researcher Thaddeus Guttenberg, with the U.S. Forest Service Mythical Wildlife Division, recently confirmed that Bigfoot is every bit as real as he is. Most people only know Bigfoot from the 1987 family classic, Harry and the Hendersons, and his recent work appearing in more than 40 beef jerky commercials. What people don’t know is that wasn’t just a guy in a suit – it was the actual hominid-like creature. But, despite his brushes, his Hollywood fame, the tall, dark and hairy creature has remained elusive. Throughout the years, there have been more than 400 reported sightings just in the California area. Since reports of his actual existence were confirmed by the Forest Service, many recreationists have spotted the ape-like creature. The first confirmed outdoor sighting on March 31 at 7:31 a.m. was by a group of teenage hikers in the Cleveland National Forest in California. They captured several great photos of the beast … but like most evidence over the years … the images mysteriously vanished. The second sighting was at the Okanogan-Wenatchee National Forest in Oregon March 26 at 10:31 p.m. The anonymous eyewitness said that he was capturing fireflies with his two kids when he heard a loud rustling sound. Then he noticed a hairy figure step out of the trees. He frantically searched for his night vision binoculars and saw that it was no bear. The last sighting this week (that we know of) was by a camper at the Gifford Pinchot National Forest in California near Mount St. Helens Ranger District April 1 at 8:31 a.m. The eyewitness was collecting wood for a campfire when she noticed a huge structure that was shaped like a nest. Not known to many, Forest Service cameras have reported many credible Bigfoot images and sounds over the years. So, the next time you’re viewing one of our “animal cams” streaming live on YouTube, pay close attention, because you just may see a glimpse of the giant creature. Keep in mind that these tips are resourceful for any adventure you have at a National Forest, not just when you encounter a 9-ft tall Bigfoot. For more information please visit, www.ThisWasAnAprilFoolsDayJoke.FS.Fed.US. An estimated 6,000 acres of open space are lost each day, a rate of 4 acres per minute. Looking ahead, the Forests on the Edge project estimates that 57 million acres of private forest lands could experience sizeable increases in housing density by 2030. Public forests are also affected -- the National Forests on the Edge publication estimates that 21 million acres of private rural lands near national forests and grasslands will experience substantial housing density increases by 2030. I'm surprised to see anyone in the USFS publicly admit to the existence of Bigfoot. I worked in law enforcement for a number of years as a Co-op Deputy with the USFS, had numerous odd happenings, accompanied by sounds, smells, and on one occasion a visual sighting. The few USFS co-workers I mentioned these things to, simply shrugged of my disclosures to them and told me, "I'd be careful who you mention this to". I can tell you of many area where I know there are different family groups in the local USFS managed lands adjacent privately-owned timber lands. Locals in the area know of the "Big Guys" that live on and around their properties. The local residence only speak locally amongst themselves due to the fear of ridicule and for the protection of the local forest inhabitants. I would talk to Mr. Guttenberg if he wishes to get in touch with me. This area is in a forest not mentioned above. Making Bigfoot part of an April Fools joke, just not make Bigfoot a myth. 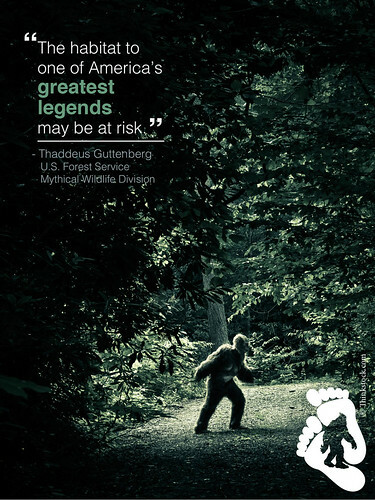 I volunteered for the USFS, and they are well aware that Bigfoot is real. However, most employees are on the need to know basis, and most of them have been judged to have no need to know. The secret about the secret is that Bigfoot is paranormal. Which makes finding them and recognizing when you have found them, quite a difficult matter. Neal B is right. Paranormal. Fall of 1971 in zip code 92399 me and four others saw a big foot run across the road in front of our car. Humans never believe anything unless they witness it themselves. We did. It is good that the US Government is finally releasing information about Sasquatch being real, too man people have said they have seen Sasquatch only to be humiliated by the public at large. As a human we need to protect Sasquatch from the crazy gun totting redneck types that think shooting one will bring fame and wealth. Somewhere along the way humans and Sasquatch have been well aware of eath other, but because of differences the Sasquatch have had to become invisible to survive. somehow we need to learn their story and allow them to habitat in safety. We humans have destroyed anything we didn't understand. May there be peace on earth to all ofus. Good humor the the bigfoot hunters won't enjoy it.